Carnival, with its street parades, Jamming, and calypso and queen shows is by no means a recent phenomenon. Our carnival has been shaped by a number of influences: other carnivals especially Trinidad’s, our African ancestry, and changing trends in music. But one common element remains, It allows us as a people to express ourselves creatively and artistically to break free, and rid ourselves momentarily of the every-day frustrations and pressures. A retrospective glance into our “Christmas Sports” reveals a rich, cultural heritage in relation to our folklore, and our music. The term “folklore” refers to a people, their traditions, beliefs and customs which are passed from one generation to another. Our Christmas Sports were played during the period from Christmas Eve to New Year’s Day. It was a time when working class people took to the streets dancing, singing, playing music and performing short dramatic presentations. Our folklore sports: Masquerade, Bull, Mummies, Niega Business, Actors and Sagwa to name a few, date back to slavery, and represent a synergism or “potpourri” of African, European, and Amerindian elements. Through these performances, the players were able to preserve some of their African customs through the use of the mask and the drum, mimic the language, dance and dress of the plantocracy, and create Indigenous acts. Today, the Masquerade, Bull, Mocko Jumble. Mummies, Actors, and clowns are the primary sports played, with the masquerade and bull ranking highest in popularity. Other sports such as Niega Business, Sagwa, Soldiers, Cowboys and Indians. Selassie, and Japanese and Millionaires which were sections of the down troupe have died out. Unfortunately, emigration, the death of players, and a lack of any organised programme to maintain some of these cultural elements have caused the plethora of Christmas Sports to dwindle, and suffer the fate of all flesh. Another main feature of carnival is the music. String band and big drum music usually accompanied the folk performances. The instruments which were played to create the lilting, rhythmic music were guitars, quartos, the fife, triangle, ‘baha’ which is a long piece of metal pipe that is blown, and the ‘shack-shack’, a tin can containing beads. In the case of big drum music, a huge drum along with a kettle drum beating out pulsating rhythms and a fife were played. During the late I 940s, the iron band was introduced and was mainly made up of car rims and drums, creatively played to create music for street jamming. It was during this period as well that a number of community bands, consisting of trumpets, saxophones, drums, and double-bass guitars, thrived. Bands such as Esperanza, Music Makers, Rhythm Kings, Brown Queen and the Silver Rhythm Orchestra were some of the established ones which featured at dances and concerts. Travel allowed for an exchange of cultural influences, and in the early 195Os steel band music was introduced into St Kitts. Mr. Lloyd Matheson C.B.E., then an Education Officer, traveled to Trinidad and brought back a pan which he introduce into the community. The Wilberforce Steel Ban from College Street was formed, and that was mainly due to the hard work of Roy Martin known as “Baby Rat”, who was the first to learn to play the pan here. Cecil “Moonlight” Roberts went to Antigua in 1952 to buy pans, and the steel band stimulated much interest. Steel bands sprouted in many villages: the Invaders from Newtown, the Boston Tigers from the Village, the Eagle Squadron from West Bourne Street and Boomerang and Casablanca from McKnight. They added a new musical dimension to St. Kitts and Nevis. Through the energies of Mr. 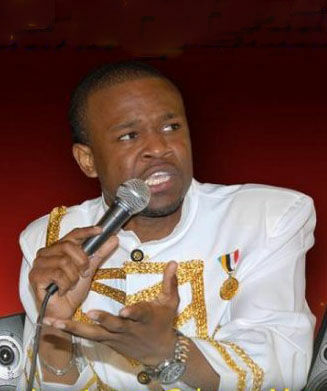 Basil Henderson a well-known community-spirited person, Carnival as we know it today was born in 1957. Before he started he first held a big meeting in Warner Park, to which he invited members of the public and private sectors, community groups and the church. Mr. Henderson informed the community of his plans for a carnival celebration. However, he received much resistance from the church, and from certain section of the community, but he was by no means daunted. 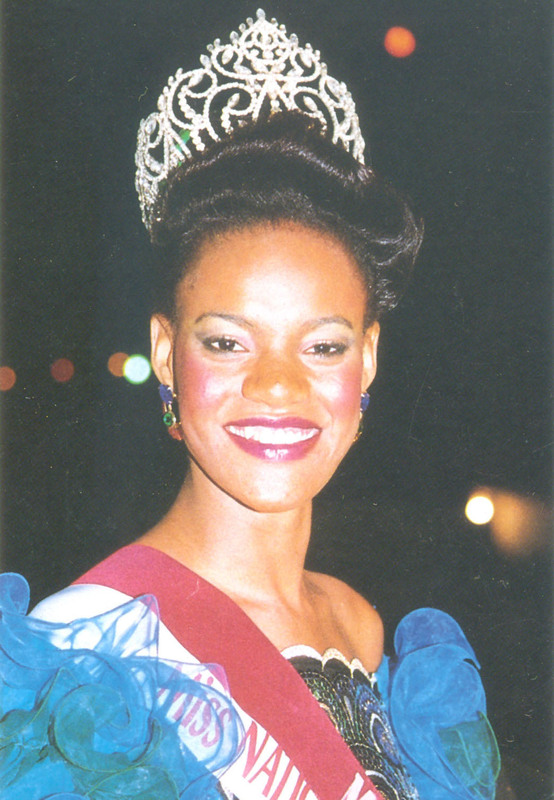 Persons such as Mrs. Vissipal, Mrs. Warren, Mrs. Agnes Skerritt, and the late Mrs. Doris Wall were members of the first carnival committee. Cromwell Bowry, and Cyril Frederick also made a significant contribution to carnival during its early beginnings Major Leonard Alphonso, a Chief of Police from Trinidad became actively involved in the development of carnival in the early 1960s, and brought out an Indian troupe, creating another perspective. The street parade with the glitter and tinsel, the queen show which was organized by the Jaycees, and the calypso show were some of the highlights. 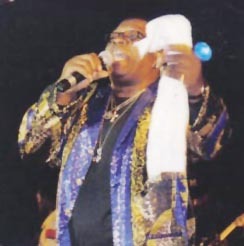 Infact, Mr. Winston Barker known as the “Mighty Kush” became the first calypso king. However, the local word for what later became known as “caiypsoes” which is in fact a Trinidadian word, was “quelbay’ or “country dance”. Calypsoes, often humourous dated back to slavery, and their content focussed on topical issues, and was a form of social commentary. The 1960's brought the brass bands with their amplification. They have grown in popularity, and now dominate street Jamming. In fact, they posed at one time a threat to the survival of string band and steel band music. However, attempts have been made to ensure that the survival of the pan, as it has become a part of the curriculum in some high schools. The I980s have brought another development: the electronic musical equipment. Electronics have many advantages especially when used properly, allowing for versatility and creativity. However, the feeling among many knowledgeable musicians and music lovers is that the development of the “Jam band” style music which characterises carnival nowadays, lacks creativity, musical arrangement and is monotonous to the ear. It can be frustrating when the electronic keyboard is left to play while the musicians relax. Many feel that there needs to be a greater appreciation of music, the noise level must be reduced, and that musicians need to listen and read more. With respect to the lyrics of the calypsoes, it is thought that they should be less vulgar and more witty. Another suggestion is that the carnival committee set and demand standards In relation to music. In the mid-60s political rivalry between the Christmas Festivities Committee and the Soul Carnival Committee, two organisers of the annual festival, threatened the development of carnival, and for a few years, there was none. It was Paul Southwell who in 1971 pioneered legislation for Carnival to be nationalized. Mr. Eldred Jenkins was the first National Carnival Committee Chairman, and he along with many others organised the shows, which are familiar to many of us today. 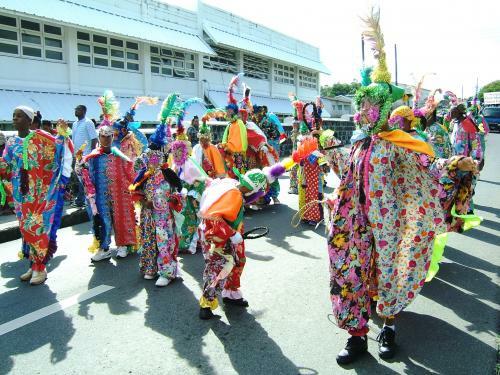 Some of the main features indude junior and adult calypso competitions, a talented teen contest, the national queen show, the ch1ldren’s Carnival which involves mainly the primary schools, and the adult street parade. As we celebrate National Carnival this is an excellent opportunity to review the development of carnival, and point, the way forward. 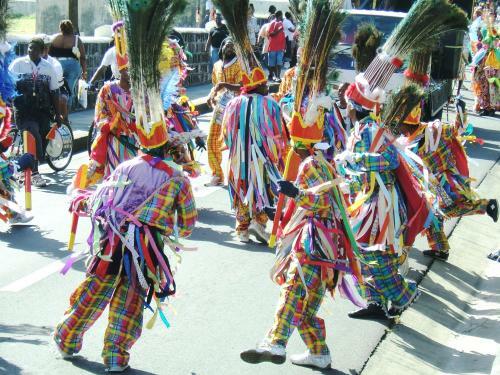 Many persons feel strongly that the folk sports need to be made an integral part of carnival if they are to survive. Another point made is that we must not try to import wholesale the Trinidad-style carnival, but retain some indigenous aspects. Greater encouragement of creativity, talks in schools and via the media to show the value of carnival, and to change the spectator mentality of nationals were mentioned as some of the elements that need to be in place for us to move forward. The need for major improvements in the seating and restroom facilities at the main village, with the erection of a cover for the main stage was another concern mentioned. With respect to music, it was thought that the carnival committee should acquire basic high-quality instruments such as a keyboard guitars, and drums, and a good public address system for the smooth transition of band changes at the shows. Whatever the suggestions offered, it should be noted that although a lot has been achieved, there is still much scope for improvements. The clowns are a part of our folk culture that finds expression at Christmas time in a festival that has been celebrated for hundreds of years. Usually one of the largest troupes with as many as fifty players, they have provided entertainment for years. The typical clown suit is a loose costume of two colours generously decorated with tiny bells which jingle as they perform their famous whip-swinging dances. The elegance and grace at which the clowns perform as they serpentine behind and between each other is a spectacle to behold. The pink wire mesh mask worn as part of the costume, hiding the face of the performer, apparently depicts the European, and is a feature of almost all the local folk dance characters. The sounds of bells and the crack of the Hunter, a leather whip carried by each performer, punctuates the rhythms of the String Band, biding closer the dancers to the musicians. An all time favourite, has its origin in West Africa. 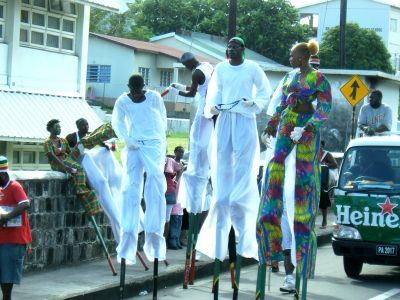 Stilt walkers or Moko-Jumbies as they are called locally, have been passed on from African mythology, particularly in the Ghana area. The name Moko, though its origin is not clear, is said to be the name of the God of Vengeance while on the other hand it is believed that the word Moko is a corruption of the word Macaw. The macaw is a very tall palm tree covered with thorns and it is felt that the Moko-Jumbies may be trying to resemble it, especially so, since their head piece is symbolic of the heart of the macaw plant when it is in bloom. They are dressed in a long gown and dance on six to eight foot stilts. Many theories have surrounded their dance, and although we may never know which is true, one cannot deny that seeing someone dance without fear on six to eight foot tall stilts provides much amusement and thrill. Masquerade in St. Kitts can be described as an art form created by the syncretism of peoples of African and European descent over a period of 300 years. This is perhaps the most popular of the Carnival sports. 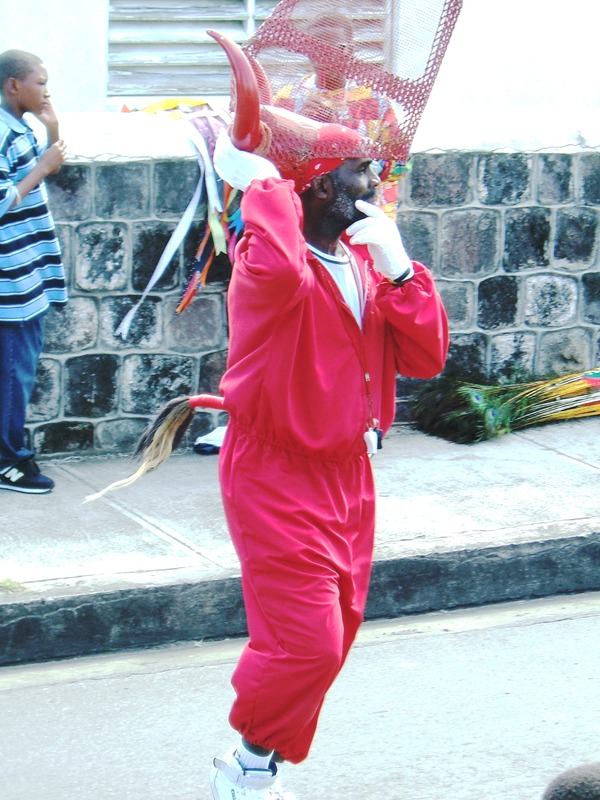 The Masquerades who have maintained their prominence as being typically Kittitian are seen wearing tall peacock-feathered headdresses, masks, trousers and long-sleeved shirts; over the trousers are skirt-aprons which are completely fringed and reach just above the knees. The entire costume is decorated with bangles, mirrors and ribbons. Dance experts have identified elements of European and African genres, which include the “Wild Mas”, the Waltz, Quadrille, the Rhumba, the Fertility Dance, the Fine Dance, the Jig and the Boillola. The “Quadrille” which has its roots in 17th-Century France is the first dance and danced by couples to a slow, structured pace defined by the country and elegance of the various dance figures. The “Fine” which is the second dance is decidedly faster and demands greater skill as the dancers dance on one foot towards each other meeting in the centre of the ring and performs a Fertility Dance which is traceable to the mating dance of Africa. The real spectacle in dance comes when the masquerades break into a frenzy of “Wild Mas” Throwing their tomahawks into the air much to the delight of onlookers. This dance is typical of the African war dance. The “Jig” introduces a new dance position where the right foot hooked behind the left foot, the dancer displays his skill with the tomahawk. This dance follows right into the “Boillola” another dance movement where the tomahawk is held between their legs while the dancers jump and clap to the music, moving from side to side. The mimicry of Europeans in dance is perhaps best reflected in the “Waltz” where the dancers pair off into couples and perform simple ballroom dance steps to a moderately fast triple meter. The bull is originated from an incident which occurred on Belmont estate around 1917, surrounding an estate manager and his prize bull. The story goes that the bull fell ill, and it is the scene of its revival that is acted out in graphic detail causing humor and havoc as the bull runs wild among spectators. The scene is re-enacted by a man dressed in red clothing a bull head-dress in which the story unfold as it had around 1917. Cast includes eight (8) players- Bull, Arthur Davis, Sweetie, Oak, Sifter, Dr. Pick-Me-Heel, Backanash, the Dog and the Police sargeant. The name actor would most likely be thought of as a group of performers taking parting a stage play. In St. Kitts, “The Actors” is a group of acrobats engaged in a series of daring somersaults over a large upturned garden fork. The Actors were created in the seventeenth century by De Poincy, the French Governor who settled at St. Peters where he erected a palace on his estate La Fontagne. Actors from the parish of St. Peters still perform skilful, hair-raising acrobatic feats. In addition to the somersaults done over the prongs of an upturned garden fork, the actors place a big stone on the chest of one of the acrobats and the stone is broken with a sledge hammer. 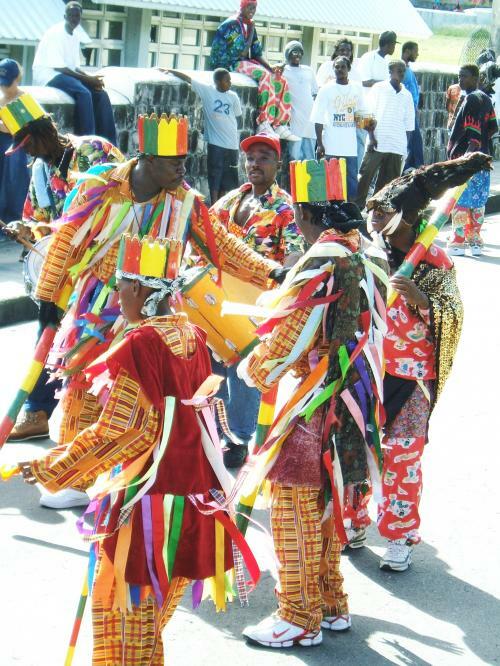 Throughout the years, Kittitians have taken their traditions and customs and woven them into a unique pageantry displaying them for all to see mainly during the Carnival celebration at Christmas time. If we lose these traditions and customs then we would have lost a vital part of our inheritance and our existence. Today, there have been 29 visitors (89 hits) on this page!